First on my list of new gear is a pair of inexpensive noise reduction ear muffs by MPOW. Padded, size adjustable headband to fit all sizes. Cups fold up into headband for more compact storage. 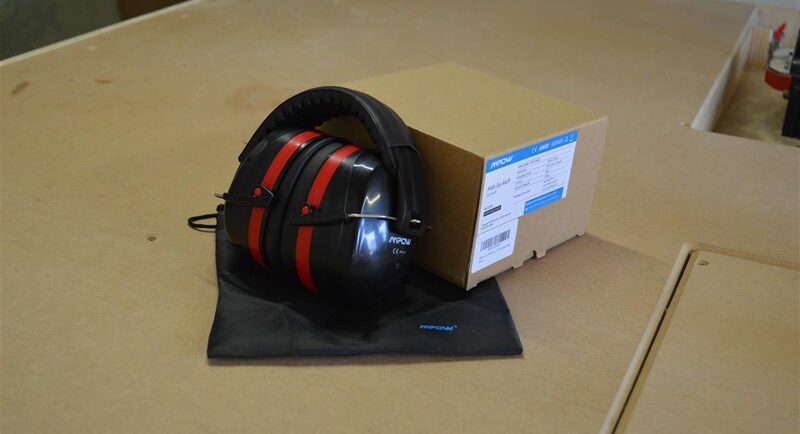 Hard outer shell cups with dual layer noise dampening foam. Available in colors – Red, black, yellow, and purple. I was pleasantly surprised by how light the muffs were despite their bulky appearance. I also found the muffs to sit quite comfortably on my head with the headband applying enough pressure to make for a secure fit while not causing any discomfort. Each foam cup fits over my entire ear making for a good acoustic seal. The product also seemed to be assembled well with the strap being especially resilient. What I like most about the muffs is that they do a great job at attenuating the noise of my table saw, miter saw, planer, etc. without completely depriving my sense of hearing. I could still hear dampened sounds which, to me, is an important aspect of shop safety. 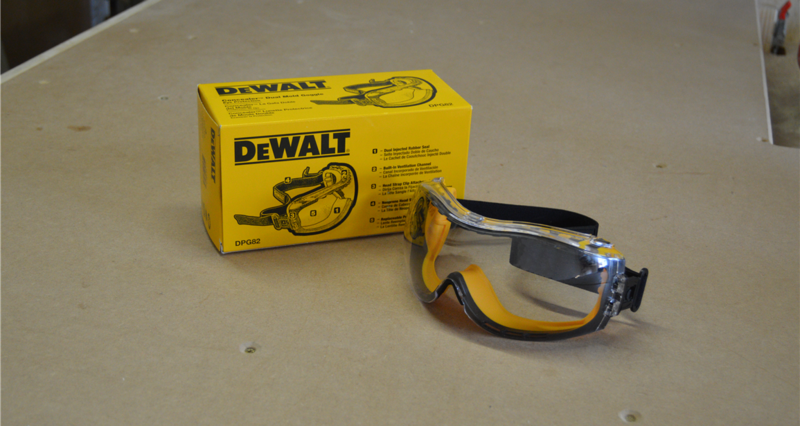 Dual mold safety goggles for protection against dust and debris. Though I mostly prefer working with safety glasses as opposed to goggles, there are situations where glasses just don’t cut it. 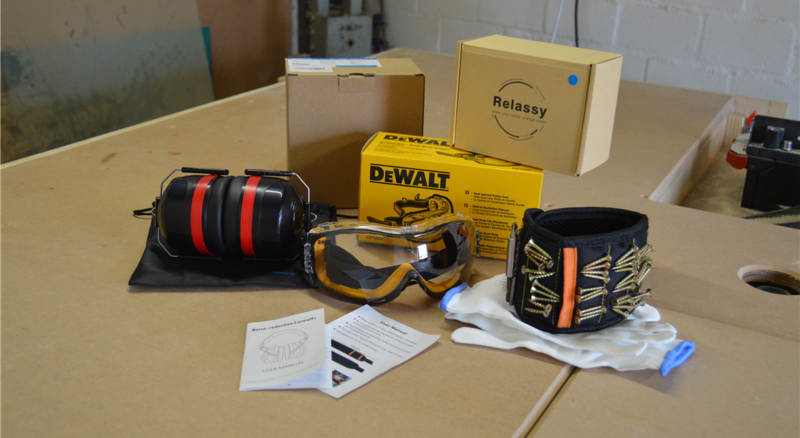 It is, for this reason, I decided to add a pair of quality safety goggles to my set of personal protective gear. DEWALT tough coat hard coated lens to protect against scratches. Adjustable, elastic cloth head strap. Soft rubber to conform to face. Replaceable polycarbonate lens provides 99.9% UVA/UVB protection. As someone who prefers glasses over goggles, I must say that the DPG82-11 makes for a very comfortable fit. The elastic strap does a great job at securing the goggles and the soft rubbers around the lens frame conform to my facial contours. The effectiveness of the scratch resistant and anti-fog coatings remains to be seen but would be a welcome addition. What I liked most about the goggles was that I could use them with my muffs as the elastic strap did not pose an obstruction for ear cups. Magnetic wristband with 15 magnets for holding screws, nails, drill bits, etc. I’ve always had the poor habit of loading up screws in my mouth when assembling projects. At some point, it started to become second nature. I decided to give the RELASSY magnetic wristband a try in an attempt to combat this bad habit. 15 Neodymium iron boron magnets (3 per row) to hold magnetic screws, bolts, nails, etc. 2 storage pockets for keeping non-magnetic small parts like zip-ties. 400mm band with a velcro strap for putting on and easy size adjustment. Besides helping to get rid of my poor habit of keeping screws in my mouth, it has also simplified the process of using the same drill for piloting and screw driving. I am able to keep a driver bit and screws loaded up on the wristband while drilling pilot holes. I can then simply swap out the pilot bit for the driver bit and continue driving the screws. The strap is well stitched and made from what seems to be a durable material. The same durable polyester material did, however, cause my wrist to start sweating in the very short time. This leads me to believe that I would need to wash the band from time to time. The question is now, would I rather have sweaty wrists or chipped teeth? I guess I’ll take the sweaty wrists.